Throughout Asia, there are written attempts to communicate in English with tourists. Often, the meaning is lost in translation. I saw this sign at a park in China. If you have any idea what it's suppose to mean, please leave a comment below because I haven't a clue. Any idea what this sign is suppose to mean? Yes, yes you do. And Dave, I love signs like this! Nice way to have a little chuckle! I still find it hard to believe city officials don’t hire a 20-something American English teacher to help translate park signs like this. I just got back from Japan and didn’t see the same problem there. 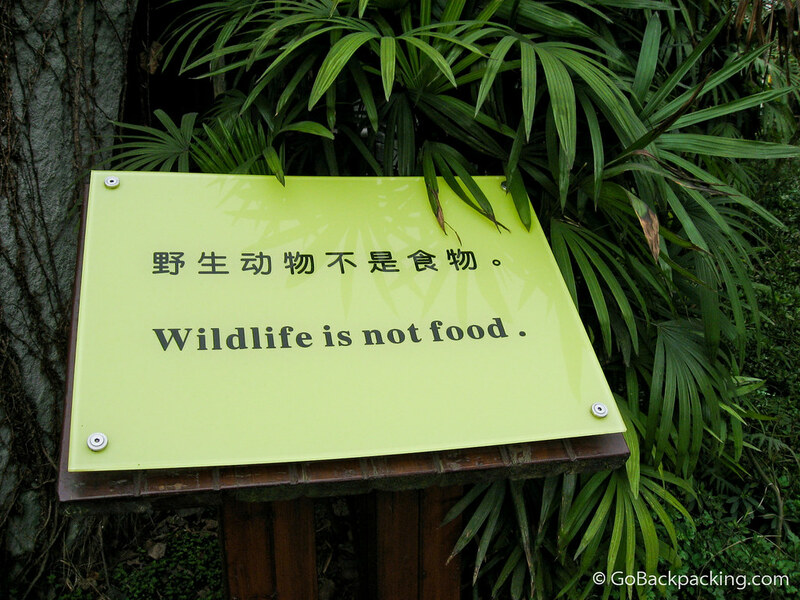 They are right… wildlife isn’t food. It’s basically translated literally word for word. Yea, Chinese signs most likely use an online translator to convert to English. Seen so many of the signs, and can’t help but chuckle at them! Thanks for letting us know it’s a literal translation! Maybe it’s supposed to be saying you shouldn’t hunt the wildlife? Or that you shouldn’t feed the wildlife? Oh how I love Chinglish. Most Russian translations sound about the same. It’s even a running joke here amongst translators. I don’t know, I think it has something to do with how fundamentally different most languages are from Chinese, so it’d might be hard to learn it.. or something. I am a Chinese but I can’t understand it as well! OMG…I guess the orginal idea was to ask people to protect the plant there or not to hurt the animals in the park during there traveling there, like the monkey, birds, etc. There are people hunting the poor little animal friends in China and the Chinese eat everything,,,snakes, cat, dog, anything..I hate that.